Published on April 7, 2010 by Wade Shepard Follow me on Twitter here. AK-TENAMIT, Guatemala– While walking through the NGO school of Ak-Tenamit, which sits around the confluence of the Rios Dulce and Tatin in the eastern jungles of Guatemala, I kept noticing these odd assemblages of two white five galleon buckets stacked on top of each other. Upon further inspection, it became obvious that they were for cleaning drinking water. The top five bucket is filled with river water and it is then placed on top of the bottom bucket, whereupon the water gradually goes through a filtering process and drips into the receiving bucket with the force of gravity. 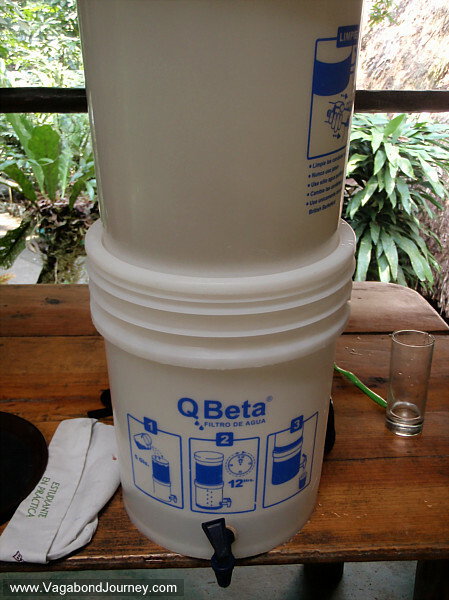 The bottom bucket has a spiket to realease the clean water into a cup or pot. Inside of the top bucket are two rods that looked to be made of some sort of sponge like material. They soak up the water, filter it, and release it into the bottom bucket. On the buckets are printed the directions for their use in English. It said clearly that the cleaning process takes 12 hours to complete. I was curious if the people here really waited this long, so I asked two different people how long it took to filter a bucket of water. One person told me 4 hours, another said that it could be done in only an hour. 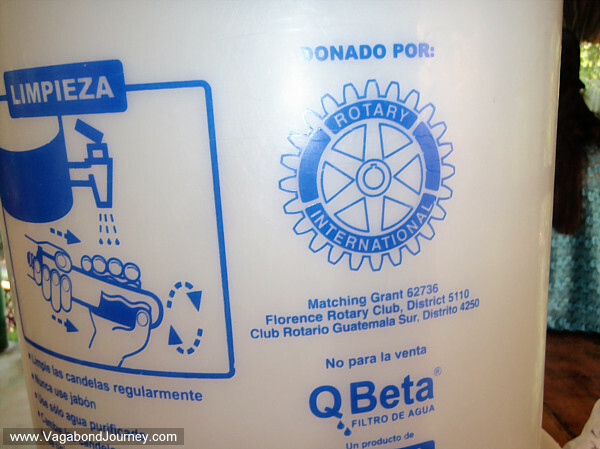 These buckets also had big labels on them that said that they were donated by Rotary, complete with the organization’s gear like logo. It is my impression that for an NGO, volunteer, or any other initiative that has to do with one culture teaching their own values for the intended betterment of another to be successful it needs to find a middle ground — a point of reference where both cultures can mutually understand each other. I have always delighted in the stories of how well meaning Eastern European governments once gave Gypsies brand new houses just to find them stabling their horses in them, or how the Nemadi just hunted and ate the flocks of sheep that the government of Mauritania gave to them in an attempt to make them sedentarized editorialist, or how when the Peace Corps supplied rural villages in El Salvador with proper toilets, just to find them filled with trash. It is difficult to make people understand that their culture is essentially defunct, that they are harming themselves by doing things the way they always have done it. People who are use to just scooping water out of a river to drink are going to be hard pressed to go through a complicated process for no other reason than some foreigner told them to do it that way. My friend Pablo at the Finca Tatin once said to me something to the effect of, “Without solutions there are no problems.” Likewise, there are so solutions unless a problem can be identified. If someone does not know they have a problem, then there is no problem. People who know no other way are hard to learn other ways. ALL cultures know no other way. I remember when I was around 10 years old a guy showed up at the front door of my family’s home and told us that our well water was tested and that it was not safe for us to drink. We had always just drank our well water straight from the tap, we never got sick from it — there was no problem. Even if we did know that there was a problem, what would be the solution — only drink bottled water? I grew up in the countryside, during my childhood years the idea of municiple water out where we lived would have been a joke. After an adjustment period my mother began buying bottled water, but my father and sister continued drinking the well water. The bottled water alternative was too awkward and top heavy of a process to be regularly institued — it would have required a change in our living pattern, a change that only worked half the time at best. Though a few years later municiple water lines were dug out to my house, and my family opted to tap into the system. We could now get drinking water from the tap — just as we had always done. There needs to be a cross over point between old technologies and new ones — new technologies often need to mask themselves as the old to be used effectively. There has to be a need to upgrade technologies, a problem identified to force even the slightest change in a person’s living patterns. There needs to be a middle ground for an NGO, or another do-gooder project to be successful. If you try to put up cross walks in an Albania village and tell people that they can now only cross the street where the white stripes are, and that cars need to stop for people in the white lines, they are just going to looked at you cross eyed. It is my impression that the Maya in this part of Guatemala are use to scooping water out of the river with buckets. Maybe by providing them with a water filtration system that is devoid of any complicated procedure, that uses equipment that is more or less common in the community for the intended purposes of use, the people may utilyze it as intended. 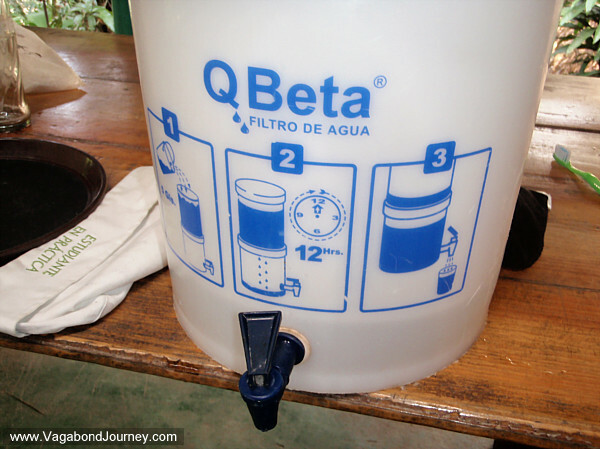 I do not know how widely these water bucket filters are in use in Ak-Tenemit or in eastern Guatemala. This seems like a good overlap of technology — people are use to scooping water out of a river with a bucket, now they only need to put the bucket ontop of another and wait a few hours to get clean drinking water. It seems as if this project could have been instituted successfully. Though I only saw these buckets in use in the formal institutional buildings of Ak-Tenamit. I observed a local woman outside of the Ak-Tenamit institutional buildings using this filtration system only once: she was using one of the buckets to wash her laundry in. Wade, I believe the wanting to is the solution. A person won’t change, can’t change really until they want to change. I heard a story from a friend yesterday: picture a circle 6 foot in diameter. That circle represents the sum of everything humans could ever know about the world. Then place a circle 2 foot wide inside the larger circle. The small circle represents the sum of human discovery and knowledge up to the present day. Finally, place a dot inside the center of the small circle. That dot represents the breadth of knowledge that any of us as individuals are likely to possess. Until we appreciate that what we know is very small and there may be much better ways of doing things and thinking about things than what we’ve been accustomed to we won’t want to change. And if we don’t want to, we’ll be very unlikely to change. But it looks like a good project the rotarians have there, it will just take time. g.
This is the pivotal point, G. Many of the people who are being “helped” by foreign NGO’s often seem to not have the true impetus to change — there is no problem, why fix it? I just really like the points in space and time where cultures meet head on — there you can really observe them clearly. One would hardly even notice the sea if it were not for the waves. Think back to when you were teenagers. Lots of *adults** would try to help you, tell you not to party so much, to save your money, to go to school, WHATEVER. Did you change? Yes, eventually. Probably not directly because of the people telling you what to do but because the situation changed (you got older and had responsibilities etc). People and civilizations can’t be made to change, there has to be a reason to, there has to be something that happens. Some social pressures are necessary to change things, but social pressures usually press towards the status quo. The best quote that I almost remember is that “Men will behave as badly as women allow them to”. People need to discover their problems and solutions for themselves. If there are no problems, then there are NO PROBLEMS and there will therefore need no solutions. And this is the often the dividing crux between cultures: the point where you find a problem and seek solutions. In the USA, the people are problem heavy — we find problems seemingly for sport, but we also often make lots of solutions. In many other countries, problems are just shrugged at and allowed to continue unimpeded. The result is that USA people have minds that are tangled up in the problems they are always trying to solve while Haitian people are smiling and joking in the streets. There is a funny bend to each culture, but they both seem alright to themselves. All cultures seem alright to themselves. I like that quote that you ended your comment with — it is true. I am a volunteer with Ak’ Tenamit so I hope to shed some light on the questions in this discussion. 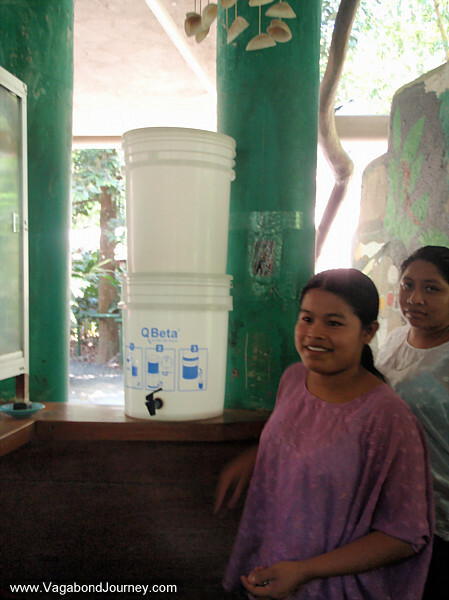 Ak’ Tenamit distributed these water filters throughout the Rio Dulce region and they actually are being used to filter water. I would not surprised to learn that they are being used for other purposes at the same time (like the woman using her filter to wash laundry). It is amazing how resourceful people become when they live in the type of poverty that this area faces. The success behind these filters lies in the approach that Ak’ Tenamit used to introduce them. Ak’ Tenamit’s employees went into these communities and talked to them about how these filters can decrease the number of deaths related to preventable water-borne illnesses. In fact, they probably visited each village several times and repeated the same talk until the message began to get through. The key to our success was that these presentations were done by people who are from these villages, not foreigners. They speak the local dialect Q’eqchi dialect and can explain the filters from a perspective that the villagers can relate to. They understand why the communities may resist and can address those issues. It is not a matter of imposing another culture (the Rotarians simply donated the funding for the filters). Death from water-borne illnesses is one of the biggest killers in this region and once the villagers understand that dirty water leads to death they are more than willing to try a new solution. Yes, I know about Ak-Tenamit. Please tell Mariah in administration and Jasmine and Omar in medical that Wade says hi and that he misses them.